For premier Institutions such as IITs and of similar league, the eligibility for entrance exam is min. 60%. For rest, There is no specific eligibility % criteria. 2. A sound understanding of financial and business principle. Mining Engineering also referred as mineral engineering, deals with exploration & extraction mineral ore, petroleum and oil deposits on earth's surfaces by using advanced mining technologies and sophisticated mining equipments. Mining Engineering involves all phases of mining operations starting from exploration and discovery, checking the feasibility, development, production, processing and marketing to final land restoration and rehabilitation. It also deals with drilling and blasting, materials handling, rock mechanics, mine health and safety, mine ventilation, mine cost engineering, ore reserve analysis, operations analysis, mine planning and minerals processing. A mining engineer has to study various aspects related to the process of mining, such as drilling, blasting, mine ventilation, materials handling, mine cost engineering, rock mechanics, ore reserve analysis, operations analysis, mine health and safety, and mine planning. The Mining Engineers can start working as mining manager, mine designer, rock engineering, mining economics, geology project design or consulting engineer. The main function of mining engineers is to put the knowledge of scientific theories, engineering fundamentals and developed technologies to discover and recover natural resources in a profitable manner. They work for locating natural reserves of minerals, petroleum and other useful natural substances, and then to lay out plans, devices shafts, inclines or quarries for the safe extraction of these resources, whether they be coal, petroleum, metallic or non-metallic minerals, from under the earth. 5. M.Sc. In applied geology 6. M.Sc. In applied geophysics etc. There are great opportunities both in Govt. sector and in private sector. Mines, Minerals Development Corporation and Mining Department of Union and State Government are always in need of skilled mining engineers. Mining Engineers can be employed in various departments of the mining industry, including engineering, operations, sales and management. 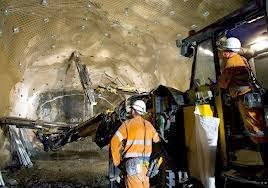 . . Mining engineers can also opt to work with geologists in order to explore and assess new ore deposits or conduct research to create new and effective mining procedures and techniques. ONGC, Coal India, Geological Survey of India, HCL, IPCL, Neyvelli Lignite Corp., NALCO, TISCO, TELCO, Reliance and MNCs like British Gas and Schlumberger are some of private sector recruiter.